..Yes, the ‘should’ is absolutely neccessary in that title. When I’m working on a project, I tend to use a very specific naming scheme for my cosfiles and image files, but other than that everything of the project gets thrown into the same map, so if I want to compile the whole thing it’s a painless experience. I always prefix my .cosfiles with the ID number they have. That way when I need to write their ID number down in the script somewhere, I can just glance at the filename. Also each .cosfile has a caos2pray chunk so if I would want to inject it as an agent I can just compile it. Any .c16 files get prefixed with the name of the project, and suffixed with the name of the artist (except if draw them myself or if they are are grabbed/recolored from C1/C2/C3/DS). To compile the whole project I create a new installer.cos file, create a caos2pray chunk that includes pretty much every file in that map and LINK the cosfiles into the caos2pray. Then if you want the complete agent to compile you can just drag the installer on Monk. You’ve probably read some tutorials here and there and tried to make a .cosfile on your own. Now the thing is, how do you actually get a neat .agents file that will show up in the agent injector? What about EasyPray? And a prayfile? Not needed. We’ll use Caos2Pray. There is an excellent explanation in this article on Naturing :: Nurturing. The only thing it misses is an example of the *# LINK command, a very useful command I will explain further below. For this case, we’ll go with making an easy script. You know, the tiny empathic vendor thing in the workshop? That little floating thing? It always annoyed me that I couldn’t separately inject it. But no more, I’ll teach you how to make it show up in the agent injector. Create the CAOS2Pray and compile the script into an agent. For now, just open CAOS tool and create a new file. Since this is an existing object which gets loaded when the world gets loaded, the script is placed in the bootstrap/010 Docking Station/ folder. We need to know the classifier of the existing empathic vendor to be able to create a new one that uses the same script. Feel free taking your time to browse in the bootstrap folder and learn what stuff you can find here. For now, we need the mini empathic vendor script. This script is called mini empathic vendor.cos. Open it and search for the bit where the vendor gets injected into the world. Copy this into your cosfile. We won’t need the part where the vendor gets moved into the workshop and the chamber, so you can entirely remove that part. Also, since va00 is being used to make the containment chember pick up the correct agent, that’s not needed either. This creates an instance of the empathic vendor. Now we only have to move it to the agent injector. The ‘move something somewhere safely’ command is mvsf X Y. You now made a cosfile that injects a mini empathic vendor in the agent injector space. For completeness, you should now add a removal script on the end that removes every mini empathic vendor in the world. If you manage to have CAOS tool working with your game, you could now inject the cos script by going through Inject – Inject install script (f9) or Inject install and event scripts (f11). If CAOS tool can’t communicate with your game, no worries, we’ll create a CAOS2PRAY chunk on top of this cosfile now, so we can compile it with Monk. If you haven’t read the post on Naturing :: Nurturing yet, I urge you to do so now. It will help you understand the next part. You can now save your cosfile, open Monk, drag & drop your cosfile on Monk, and… The magic happens! An agent called “miniempathicvendor.agents” is now in the folder where your .cos file originally happened to be. Put the agent in your agents/ folder, make sure that you click on the ‘chat’ tab before reopening the agent injector window, and your agent should now show up under “Mini Empathic Vendor (DS)”. 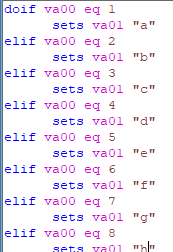 This would be handy incase you’re making a metaroom project, for example, and have each toy, plant and animal coded in its separate .cos file, which you can then compile into one huge .agents file. You don’t have to link the cosfile you run this command from. I will occasionally post some coding tutorials and other commented code for Docking Station here. In this post I’ll show the development environment I’m using, and I’ll explain you how to set up your own under Windows 10. I guess I’ll post tidbits of the stuff that’s currently in development every now and then. At the moment I’m working on a capillata extension together with Jesseth. I don’t know if the elevines will look like this in the final version, for now they’re just placeholders. You can find a preview video at the top of the page.